A NEW REPORT on the potential impact of minimum unit pricing for alcohol has said that such measures would only affect a small proportion of the population. Research led by the Royal College of Surgeons in Ireland and the Health Research Board is said to have shown that a minimum unit price of €1 per standard drink will primarily target “high risk drinkers”. Any measures to implement minimum pricing would be problematic, however, after the European Courts of Justice ruled a similar plan in Scotland illegal last year. This report found that one in seven (14%) Irish adults who drink alcohol, purchase it at less than €1 per standard drink which is below the minimum unit price. The majority of this low-cost alcohol (69%) was purchased in supermarkets. Of the 3,187 Irish adults who responded to the survey almost two-third of respondents reported “high risk drinking”, with men being more likely than women to do so. The researchers believe that their findings present strong evidence for implementing minimum pricing on alcohol in Ireland. Lead researcher Dr Gráinne Cousins said: “Some opponents of minimum unit pricing are concerned that consumers using alcohol in a low-risk manner will be punished with higher prices. “Our findings do not support these concerns, as unlike tax or excise measures, the introduction of a minimum unit price would affect less than 14% of the population. Our findings indicate that the health benefits of introducing a minimum unit price in Ireland will also be greatest among those on lower incomes, in terms of reductions in alcohol consumption and harm. “As a result the introduction of minimum unit pricing in Ireland is likely to target those suffering the greatest harm, and reduce alcohol-attributable mortality in Ireland,” she concluded. This is the first Irish study to examine the potential impact of minimum unit pricing for alcohol at a population level. With the judgement by the EU court in Scotland, Ireland is similarly open to a legal challenge if minimum pricing was to be implemented here. 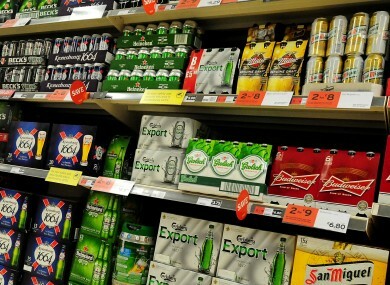 Last month, however, Scotland’s highest court backed plans to introduce minimum pricing, the Guardian reports. When the European Courts of Justice declared such plans illegal, it indicated that domestic courts should have the final say on the matter. Scotland’s most senior judge, Lord Carloway, ruled that minimum pricing does not contravene European law. Email “Report: Minimum unit price on alcohol would only affect 'heaviest drinkers'”. Feedback on “Report: Minimum unit price on alcohol would only affect 'heaviest drinkers'”.